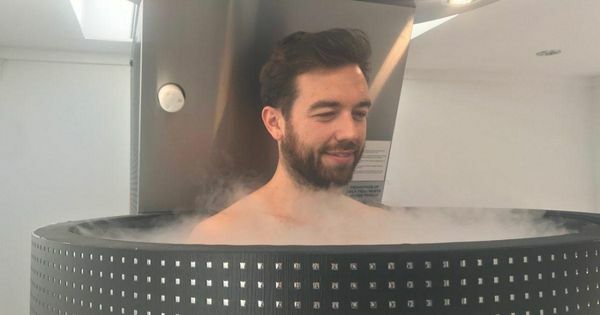 Looking like something fresh out of an ’80s sci-fi flick, cryotherapy is the latest craze to hit the mainstream. Used by athletes and celebrities looking for their next holistic fix, those taking advantage of the tech are adamant that it’s way more than just a gimmick. Apparently, freezing yourself for several minutes can aid muscle regeneration, boost your immune system and rejuvenate your skin. But what exactly is it? And does it really work? Well, I tried it out at Saisei holistic cryotherapy studio in North London to find out. Before I go into how it feels to step inside a coffin-sized cryo chamber, let’s have a look at what exactly is cryotherapy. Literally meaning “cold therapy”, cryotherapy is a technique where the body is exposed to extremely cold temperatures for several minutes. It can be delivered to just one area, or you can opt for whole-body cryotherapy like I did. The latter includes immersing the body in extremely cold air for several minutes, in the belief that you will receive a number of health benefits. You stand in an enclosed chamber that surrounds your entire body but has an opening for your head at the top, and the cool air, or liquid nitrogen vapor, circulates around your body in the chamber for 2 to 3 minutes. The cold air is delivered to the chamber via a cylinder of liquid nitrogen vapor, which ranges between -120˚C to -160˚C. When I visited Saisei, I met with the studio’s owner, wellness and fitness strategist Nyambe Ikasaya. He told me that the cold air of cryotherapy doesn’t have any moisture in it, so it’s much more tolerable. This means it doesn’t penetrate deep into other tissues likes muscle and bone, and thus works on the surface area of the skin so you warm up fairly quickly after the treatment. He continued to explain that the first step the body takes to protect its core temperature is to redirect blood from superficial vessels and capillaries in the skin towards deeper structures. This causes blood to flow from the periphery (legs and arms) towards the central core. What I liked the most about this treatment is that it very holistic, we are just getting the body to do what it already does naturally in an enhanced way. After leaving the chamber, you’ll instantly feel more alert and – strangely – happier. This is apparently normal, as being exposed to such cold air is known to raise endorphin levels temporarily. I had quite a sore knee after training in the lead up to my triathlon and definitely felt like the soreness had been reduced immediately after the cryo treatment. It was, overall, a very pleasant experience and I would do it again. Although it doesn’t come cheap. Ikasaya also told me that cryotherapy is said to help with activation of BAT (Brown Adipose Tissue) otherwise known as “brown fat cells”. Cryotherapy is also said to contribute to the release of a hormone called Adiponectin. This is a hormone which is released from fat tissues during consistent exposure to extreme cold and increases circulation, which leads to increased metabolism and fat burning. It also increases insulin sensitivity and reduction in inflammation as well as the number of mitochondria in skeletal muscle, helping with enhancement in muscular size, strength, and endurance.